"Made with the rind of the watermelon. Let the hogs go hungry tonight!" Place watermelon rind in a saucepan and cover with water and bring this to a boil. Reduce the heat; simmer uncovered for about 10 minutes or until the rind becomes tender and translucent. Remove from heat and drain. Place cooked watermelon rind in a large bowl and add the cranberries, walnuts and vinegar. Combine the sugar, pumpkin pie spice, flour, and the salt. Add this to the rind mixture and stir well. Line a 9 inch pie plate with bottom pastry, trim the pastry even with the edge. Add the filling. 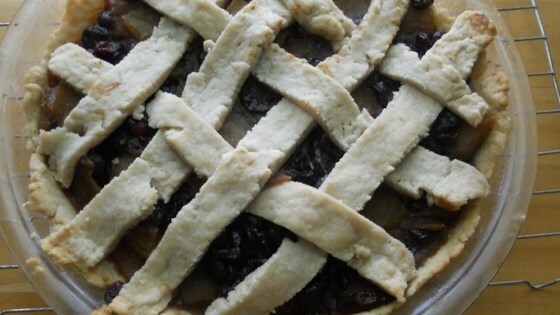 Roll out the remaining pastry and make a lattice crust. Seal and flute edges. Cover pie with aluminum foil and bake at 425 degrees F (175 degrees C) for 20-25 minutes. Remove the foil, and bake for another 20-25 minutes or until the crust is golden brown. In a small bowl, combine confectioners sugar, orange rind and orange juice. Stir to combine, and spoon over hot pie. Cool on a wire rack. Filling was bold and flavorful. Just delicious! Reminded me a lot of mincemeat. Great recipe. I will definitely make this again.